@magnus Hello. 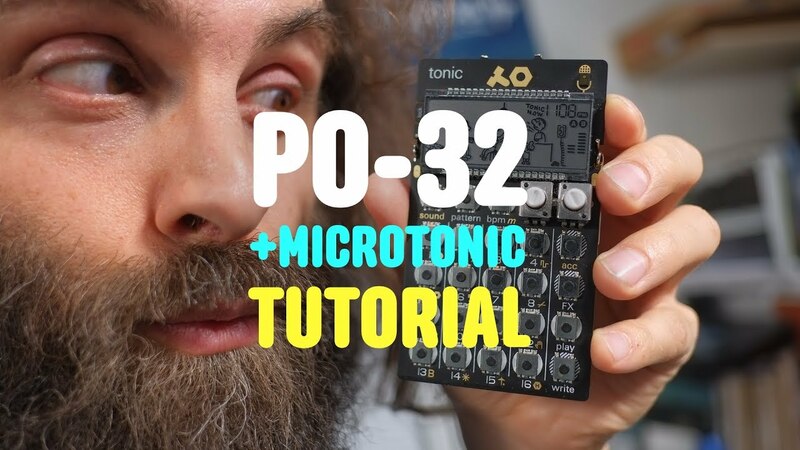 I watched the last Cuckoo video about PO-32 and he showed wonderful FX that are made on the synth engine. Please tell us more how are the achieved? Are they possible in Microtonic? Is there some list or manual about them? They are possible to replicate in Microtonic, but some of them may be very hard to do as they change a lot of parameters simultaneously. I might as well document all the effects here and now. All parameter changes performed by the effects applies to all drum channels simultaneously. Many effects change the pitch (just as the left knob does) and this means changing all three frequency sliders by the same amount (osc, noise and eq). Also all envelope parameters (osc attack + decay & noise attack + decay) are adjusted inversely by 1/4 of the amount that the frequency changes and osc mod rate is changed by 1/2 of the amount. This is so that drums sound stretched out and slower when pitching them down and faster when pitching them up. Slows down sequencer playback tempo to half and pitches sounds down one octave. Sets distort to max and lowers level by 1/8 of full range. Increases decay (both noise and osc) by 1/4 of full range and lowers level by 1/16. This effect is achieved by repeating the current sequencer step every 1/8th, lowering level by 1/8 (of full parameter range) for each of the four first eight steps and increasing them back to full level on the next four steps (then repeating over). Also attack and decay parameters are increased slightly (attack by 1/128 per step and decay by 1/16) when level is dropped to "smear" the sound a bit. Cause it sounds cool. Modulates the pitch (including envelopes etc as described above) by a triangle waveform performing a complete cycle every 1/8th of a bar. Modulation amount is -1/8 to +1/8 of full frequency slider range. Sweeps eq frequency from minimum to maximum over the time of a full 4/4 bar. Also eq gain is set to 1/2 (i.e. +/-0 dB) and then ramped up to maximum (+40 dB) over the first two quarters. This is like turning both the left and right knob on the PO-32 from minimum to maximum over the full 4/4 bar. In other words, changing pitch from -1/8 to 1/8 of full frequency range (including effects on envelopes etc described above) and morph fully between left and right setting. A combination of the following parameter changes: mix is increased by 1/4 (in other words, more noise), noise attack and decay is decreased by 1/4 and osc decay is increased by 1/8. This is a pure sequencer effect where only three of each group of four 1/16th notes are played out, evenly spaced over each quarter. (It uses the first, second and third 1/16th note, unless there is no trigger on the third in which case it uses the fourth instead.) In other words: making triplets. Simply repeats the current sequencer step every 1/24th of a bar. Repeats the current sequencer step even faster: every 1/32th of a bar. osc mod mode is set to "sine", osc mod amount is set to full (= +/-4 octaves), osc mod rate is set to 3/4 of full range (circa 200 Hz), osc and noise attack is increased by 1/16 of full range and level is decreased by 1/16 of full range. Retriggers every note eight times extremely fast (around 11ms between each). Also decreases level by 1/16 of full range. Sets noise env mode to "exponential" and increases all osc and noise attacks by 1/2 of full parameter range. The effects in the PO-32 are brilliant. The Bouncing Ball used sparingly can add nuance and flavor to a groove, but hold it down and it really mangles the beat in a super cool way.